Below is a list of the top free agent signings of the 2010 NFL offseason. Terrell Owens’ name is not on the list. Right now the signing of T.O. by Cincinnati is making waves and getting headlines. But all of that hype is coming from people either outside of the sport or from people that are worried more about the entertainment aspect of America’s Pastime than they are the execution aspect. The reality is that while Owens is now more caricature than pass catcher he doesn’t really address the core needs that the Bengals offense has. He’ll sell some tickets, sell some jerseys, and keep people talking about the Bengals – which is never a bad thing – but he isn’t one of the top impact free agents this year because I think that he is, essentially, a No. 2 or No. 3 receiver at this stage and not a guy that’s going to put the Bengals over the hump. LaDainian Tomlinson is another perfect example of this phenomenon. LT was reportedly a “big” signing for the Jets this offseason. But right now he’s not nearly as good as his predecessor, Thomas Jones, and in essence the former Chargers star was basically signed to be a backup running back. How, pray tell, does that free agent signing warrant the obsessive attention that it has garnered? So no, signing No. 2 receivers and signing backup running backs doesn’t register with me as “key” or “impact” free agents. And as a result they don’t make my list of the top NFL free agent signings for 2010. My list isn’t an attempt to “rank” the top free agent signings. I’m not going to project how these new pieces will fit in. But I’m listing the most important signings, as I see it, from this offseason in terms of quality of player and calculation of need for the benefiting organization. There are 10 other teams that I think could have completely transformed their defense by signing Kemoeatu and putting him in as a tackle in the 4-3. (The Bears, I feel, would have benefited twice as much by getting Kemoeatu than by signing Julius Peppers.) But the Redskins were there to scoop up the mammoth tackle and now he looks like he could be the opening game starter at the nose in Denver’s 3-4. He’s recovering nicely from an Achilles injury that cost him last year. And the hidden value here is that if Kemoeatu can play at the nose then that will allow the Redskins to move Albert Haynesworth – who has already, quite loudly, expressed that he doesn’t want to play nose tackle – to defensive end. Kemo’s progression could wind up being the key to the whole Washington defense. The Eagles lost Chris Cocong and Will Witherspoon in the offseason and are now banking on Sims. Sims is a former first round pick, but it’s tough to gauge his career at this stage because he’s been playing in Detroit for some of the worst defenses in league history. How culpable is he in that fact? Sims is small and fast and in on a lot of tackles, so he fits in with Philadelphia’s scheme. He’s penciled in as the starting WILL linebacker and we’re going to find out what this guy is about this year. The Bears inked the marquee free agent of the offseason when they got Peppers. Now, I think that the signing was a ridiculous maneuver – more a stunt by a desperate front office that knows that it’s one more mediocre season away from getting the axe – and that it doesn’t help the Bears long-term. They had other needs and I think that they overpaid for a guy with a questionable work ethic (who is also on the back nine of his career). But all that said, Peppers can still be a force. And if he can find a way to post one of his 15-sack seasons that could take some pressure off other areas of the Bears defense that are lacking. 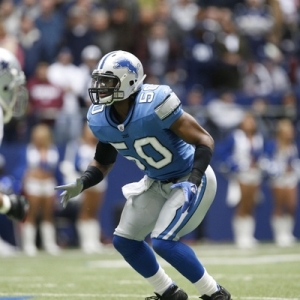 The signing of Vanden Bosch, one of the league’s most underrated players, and the trade that brought defensive tackle Corey Williams to Detroit is what lets me know that the Lions are headed in the right direction. They are getting serious about stacking up their defensive line (they brought in some solid offensive line help as well) and that’s exactly where a building team needs to start laying the foundation. Robinson has had a star-crossed career with Houston, but now is getting a fresh start with Atlanta. He has really come into his own the last couple years, though, and instantly has become the top corner on the Falcons roster. Secondary woes are what submarined Atlanta’s 2009 campaign. So not only is he a very good player but he fits a desperate need. Ken Whisenhunt has succeeded in building “Pittsburgh West” over the last three years by bringing in a host of former Steelers coaches, players, and schemes. And Porter and Faneca were two of the leaders and top players from the sensational Pitt teams from the mid-00s. Granted, both players are past their primes. But Faneca was a Pro Bowler last year and the undisputed leader on the offensive line leading 2009’s No. 1 rushing attack. And Porter had nine sacks last season and 17.5 sacks in 2008 down in Miami. He’s started all but two games the last three years and will bring some nasty and some attitude to a team that lost its best linebacker (see below). Dansby was the top linebacker on Arizona’s playoff-bound defense last year, and over the course of the past two seasons he has managed 228 tackles, five sacks, three interceptions and three forced fumbles. I know that the addition (via trade) of Brandon Marshall garnered the biggest buzz in South Beach, but Dansby is going to be equally important in the heart of that defense. Grant was a recent signing and is a really nice pickup for the Fins defense. He comes with some baggage, but he was also a key component of New Orleans’ defense last year and a guy that notched double-digits in sacks in 2003 and 2004. If he can regain that form he could be a steal. But Dansby is really the key here. Don’t think that a kicker can be a key free agent acquisition? Tell that to the Texans, who watched as the previously reliable Kris Brown cost them two games last year by missing critical kicks in back-to-back weeks against Tennessee and Indianapolis. That could be the difference between Houston coming off a 9-7 year or an 11-5 year and a playoff trip. Like all kickers, Rackers has been streaky in his career. But he is 41-for-45 (91.1 percent) over the past two seasons and is 130-for-154 (84.4 percent) over the past five years. In a league with a razor thin margin for error, Rackers could make the difference. Jack Del Rio is in a make-or-break season as Jaguars coach. And he’s banking his defense on the abilities of two low-key, underrated free agent defenders. Kampman had some success as a linebacker in Green Bay’s 3-4 defense last year before an injury ended his season. But he wants to go back to being a dominating defensive end in a 4-3 and will get his chance in Jacksonville. Kirk Morrison has been a quiet leader in the Oakland locker room and he’s been incredibly productive in his five-year career. Morrison has notched more than 115 tackles all five of his seasons and hasn’t missed a game in his career. He isn’t much of a big play guy, but he is as steady as they come and will be a new anchor for the Jags. I’ve already touched on Williams’ impact in my article about key NFL players coming back from injury this year (still can’t believe I left off Troy Polamalu). He was a great pickup by the Broncos. And if he can stay healthy he could really transform what has been one of the softest front sevens in football over the past two years. Bullock is another recent signing, but could be a critical one for the G-Men. A lot of ink has been wasted (in my opinion) on the signing of Antrel Rolle to play safety. But there is no doubt that the Giants entered training camp with a gaping need at linebacker. Bullock has been one of the best in the business for more than a decade. His career has been slowed by injuries in the last few seasons. But he’s still started 112 of the last 114 games that he has suited up for at the heart of a very physical Tennessee defense. He’s planning to make the move from weakside linebacker to middle linebacker this year. And if he can hold up this season he could have a big impact in the NFC East.